Just now as I've been killing time while my video renders, I read that Baz Luhrmann (one of my favourite directors) is now in his final 24 hours of production on Australia, a film that he's been working on for the last four years of his life and is now scrambling to finish on the last possible day, less than a week before its premiere. It looks as though we both have something in common. Although with only two years on mine, I'll concede that it may only be half as good as Baz's. Meanwhile, on this side of the equator I'm currently expending my last reserve of energy to try to get Adventurer finished before Vosh's 'Chris is a Failure' party. Only difference is Baz doesn't have a DVD to author too. Lazy. I'm gonna need every ounce of processing power on this computer to get this DVD finished by the deadline. It will be interesting to see how this all pans out. I wonder if Dan is going to have a trailer for our documentary ready for me to put on the DVD like he said that he planned to on our facebook group. That would be embarassing if the tables were turned tomorrow night. So if you find yourself free of any sort of plans this Thursday, come by our place for a 'Chris is a _____ (soon to be determined) party'. Drinks! 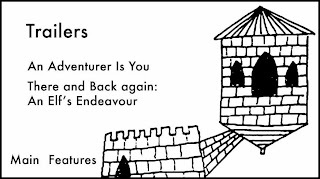 Adventurer screening! Midnight Quantum of Solace! What more could anyone ask for? The menu is ready, but will Dan deliver his half of the content? CC: We Have a Runner!